As a physician, Jin Soling can see that the Emperor is cracking, relying on Opium to drown his troubles. The Ch’ing Empire is failing, and war with the British is imminent, but the man to whom Soling was once engaged has a bold idea to save it. A leader within the Ministry of Engineering, Chang-wei suggests an alliance with Japan, whose scientists claim to have technical advancements that could turn the tide of the war. But Japan has kept itself in isolation for the last two hundred years, cutting all diplomatic ties with the Ch'ing Empire. Chang-wei must enter the island nation in disguise to seek an alliance—an alliance forbidden by the Japanese shogunate. Seeking to escape the politics of the imperial court, Soling arranges her own passage on the airship to Japan. But once they land, Chang-wei and Soling become targets of the shogunate's armored assassins. Caught between two empires, in a land distrustful of foreigners, the deadly war machines are the least of their worries. And I love Japan what with its Samurais and its own unique traditions and politics. 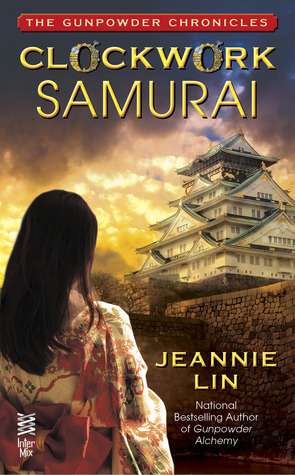 Meld it with the force of the Chinese Empire and you have a great story like Jeannie Lin's CLOCKWORK SAMURAI. The novel opens with Soling, now a member of the Emperor's household as one of his primary healers. This is definitely a step-up for our heroine, but not without its downsides for Soling finds herself in a viper's nest. Having easy accessibility to the Emperor incites envy in the court and our heroine isn't the type who revels in this kind of war. It's great that CLOCKWORK SAMURAI didn't dally in court life and proceeded to give us a stealthy and tension-filled adventure. Just the same, JLin is generous in giving us big servings of Chinese and Japanese culture especially the bits concerning Samurais. More of Soling's father is revealed in this installment which makes him more legendary IMO. The engineering aspect is also fascinating but very simplified. I also enjoyed how the relationships are portrayed especially Soling's slow crawling love life. Gah! Like I mentioned before, The Gunpowder Chronicles isn't a supernatural fantasy and it only has a pinch of Steampunk in it. The series isn't propelled by steam engines, gears and clockworks like other books in this genre. Instead, it's a great historical adventure story filled with intrigue, it's very diverse which I find very authentic to the culture it represents. Aside from the lack of overwhelming gadgetry and talk of science, the romance is such a slow burn like Mulan but not frustratingly so. So if you're looking for something to shake up your reading pattern filled with whirlwind romances and dizzying action, The Gunpowder Chronicles just might be the perfect palate cleanser for you. Oh yes I remember you reviewing the first one and seeing it around but I haven't tried it. I'm curious! I really like it, it's different from the other steampunk series. I now want to try er historical romances too. That definitely sounds different from what I usually read. I so wanna read more Lin! I love the Japanese culture. It would be interesting to see how that and the steampunk elements melds together. I had doubts but after reading this, it can work.... I know you don't read steampunk though. Bummer! I like that the steampunk is just a little part of it. So I could try this one. Great review Braine, I met Jeannie at a book signing here in town, she's a local author. I haven't read this one so yup it's now on my list! You're so lucky! I want to try her historical romances next, I heard those are good too! I have really enjoyed these Braine from the setting to the characters! Um... yes! I love steampunk and I've been enjoying the cultural variations other than English out there. This one is going on my wishlist. I hope Soling gets some good loving in book 3, she needs it bad! I'm okay with the steampunk being light but appreciate the warning cause I could be a little disappointed if I expected it to be pretty strong. This series sounds great! You write well! Well-written review! Ever thought about writing something, aside from reviews? I really love the sound of this series. Especially the diversity! Steampunk samurai! Nice. :D Thanks for sharing about this. I think I own one of this author her books, but haven't read it yet. I've read some reviews by Sophia about this author her books and now this one on your blog and it makes me curious to give one of her books a try! That's great the authors incorporates so much Chinese and Japanese culture in this book. I always like learning a bit more about other cultures when reading. And I love a good slow building romance. This sounds like a series I might enjoy. Great review! I like the idea of reading something set in Far East Asia. I don't know much about samurais, but it would be interesting to read more about them. I like that it's not overpowered with steampunk elements. Sounds like a fun read!